When your bathtub starts to start show its age, you can refinish it to make it look new again. Sometimes, you may also remove hairline stains by refinishing your bathtub, but before you do, make sure that those stains are not cracks which may indicate that you might have to replace your entire bath tub. 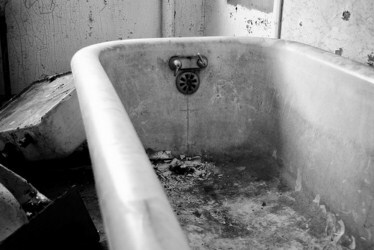 After all, the idea of soaking in a badly stained bathtub after a hard day’s work is just not appealing. First of all, you will need to remove the drain cover and lever plate that covers the drain. Next, remove old caulk and silicone from around the edges of the tub. You will now need to clean your tub with cleaning powder or a nonabrasive cleaner as well as scour the tub. After you have completely removed all soap scum, oils, dirt, rust and other residue, rinse the tub thoroughly. You may also need to sand the surface of the tub with sandpaper and vacuum the tub thoroughly to remove the debris. Wipe the surface with a tack cloth and apply the second solution that comes together with your refinishing kit using a specially textured pad to prepare the surface for refinishing. Rinse the tub once again and leave it to dry. Once it is completely dry, apply the primer reducer with paper towels and leave it to dry. Next, prepare the area for refinishing by first taping off the areas that you don’t want repainted and cover the surrounding areas and fixtures with plastic bags and secure them with tape. Make sure you have on safety gear for the next step, and leave the bathroom doors and windows open for maximum ventilation. Prepare the primer by mixing it according to the directions from the kit. You can use a roller and brush or even a paint sprayer to apply the primer coat. Once you have completed the first coat, let it dry and remember to leave the bathroom windows open for optimum airflow. Once the first coat has dried, you can now apply the topcoat using either a roller and brush or spray gun. Make sure to catch any drips as they happen as they become permanent once they dry up. You can now remove the masking tape around the tub but do not remove the plastic coverings on the fixtures yet. Leave the last coat to dry according to the directions from the kit. It takes approximately 48 hours for the entire coat to dry. You can then remove the plastic covering from the fixtures. This entry was posted in Home Improvement on April 15, 2010 by Mike.